MELAKA – Hatten Hotel Melaka is proud to launch our Indonesian themed ‘Berbuka Puasa Buffet Dinner’. Our kitchen team headed by our Executive Chef and with the help of our Indonesian Guest Chefs, Chef Sutanto and Chef Sukri are ready to give their best for Ramadhan this year. The buffet spread will boasts a plentiful of salads, pickles, meat, seafood, barbeque, desserts, an assortment of hot and spicy dishes and free flow of selected drinks in three rotational menus from 11th July until 7th August. On the spread cover consisting an assortment of cold & warm appetizers such as Gado – Gado, Pecal Sayur Bakwan, Rojak Bandong, Bakwan Udang, Ketupat Sotong, Tauhu Isi, Ayam Suwir Malang, Pare Isi Kelapa Ikan Teri, Daging Sambal Salada, Sari Laut Santan, Botok Tempe, Karedok, Nasi Tumpeng Komplit and many more. Those with an eye on their health can toss up their own Ulam-Ulam Kampung, or pick from a variety of ready-made or DIY salads on offer. For the main course, guests may indulge in our traditional Javanese cuisine such as Nasi Brongkos, Ayam Penyet, Daging Opor Daging Sapi, Kambing Bakar Rica-Rica, Botok-Botok Ikan, Udang-Udang Bumbu Rojak, Sayur Campur Masak Jamur, Telur Asin Kukus and Ketam Kukus Halia. In addition, there will also be a carving station serving Slow Baked Whole Lamb and Baked Sambal Whole Sea Bass Fish. There are live action stalls serving up a variety of sumptuous delicacies like barbequed Lamb Chop, Chicken Chop, Squid, Mackerels, Assorted Satay, Roti- Prata, Murtabak & Kebab with a choice of Chicken or Beef served with Chicken Curry, Mutton Curry and Lentil Vegetable Curry, Grilled Otak-Otak, Goreng –Goreng such as Pisang, Cempedek, Sukun,Ubi Keledek, Keladi, Karipap and Chicken Rice with Roasted Chicken or Duck. Guest may continue their journey by indulging in the range of desserts, consisting of local and international choices; Chocolate Fruits Fondue, Custard Puddings, Malay & Nyonya Kuih, French Pastries, Bread Buttered Pudding, Bubur Kacang Hijau with Durian, Lychee Kang, a selection of Ice Cream, Iced Kacang / Cendol, an assortment of Malay Cookies and Fruit Jelly Cups. Endless fruit juices, tea and coffee will combine to create a feast the whole family will enjoy – even the fussy eaters. To further enliven the whole dining experience, live Traditional Ghazal entertainment is available daily (except Thursday); not only that – Muslim diners may also perform Solat Maghrib and Isyak without having to leave the hotel as a Surau is available on the 10th floor. 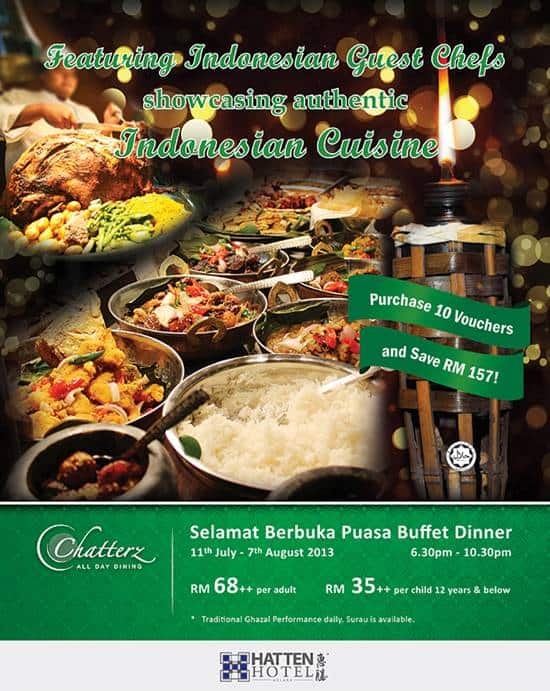 The Indonesian themed ‘Berbuka Puasa Buffet Dinner’ priced at RM68++ per adult will be served from 6.30pm – 10.30pm at Chatterz, All-Day Dining. Children 12 years old and below can enjoy a 40% discount. Guest can save up to RM157 when they purchase a booklet of 10 vouchers. Instead of paying RM788, they would only need to pay RM631! (Not valid with other discount schemes and programs). All dishes are halal. Reservations are recommended. For further information and reservations, please call Hatten Hotel Melaka at 06-221 9448. Datanglah ke Hatten Square untuk menikmati keenakan makanan serta suasana yang serba mewah ini.